When it comes to selecting the quality of your diamond, the Four C’s are usually all the discussion. I suggest paying attention to all of the diamond’s characteristics most importantly the cut, but there is another one worth noting which could be the fluorescence of a diamond. 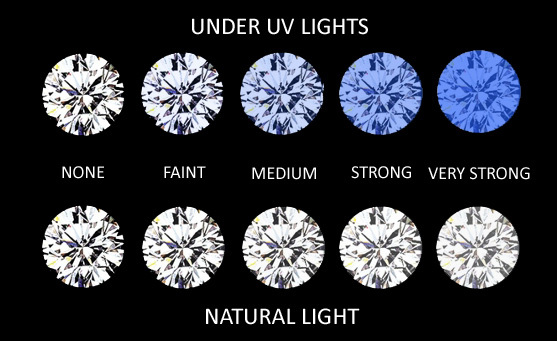 When speaking about diamond fluorescence, we are referring to the diamonds tendency to emit light or a glow when exposed to a black or ultraviolet light. Finding out if your diamond is fluorescent place it under a UV light and the diamond will exhibit a blue colour. Being assessed by a gemologist the fluorescence of a diamond is graded anywhere between None, Faint, Medium Blue, Strong Blue, Very Strong Blue. Fluorescence does not affect the integrity of your diamond but it can affect the colour and sometimes the brilliance if it is too strong. While not usually a big issue, it can affect the price of the diamond up to 20%. If a diamond has None or Faint fluorescence, you shouldn’t be able to tell any difference in the appearance or colour. This is good if the diamond already has a G or H in colour or better. If your diamond is below H colour, a medium blue fluorescence can actually make it look whiter than it is. For example if you have a J coloured diamond that is really well cut with medium blue fluorescence it would look like a grade higher in colour, saving you some money as well. I would not recommend buying a diamond with strong or very strong fluorescence because it can give the diamond a milky or hazy look effecting the overall brilliance and sparkle of the diamond. Don't let fluorescence over influence and impact your choice when selecting a diamond. Keep in mind that 1) fluorescence has a negative impact on colourless diamonds making them appear milky and cloudy and 2) a positive impact on faint yellow diamonds, faint to medium fluorescence counter-balancing the yellow colour, making the diamond appear whiter.